The worldwide Ethernet switch market (Layer 2/3) exceeded $US6.1 billion in revenue in the third quarter of 2015 (3Q15), an increase of 2.0 percent year over year and a healthy increase of 6.1 percent quarter over quarter. Meanwhile, the worldwide total enterprise and service provider (SP) router market could not repeat its exceptionally strong growth from last quarter and ended 3Q15 flat on an annual basis and down -7.2 percent quarter over quarter. These growth rates are according to results published in the International Data Corporation (IDC ) Worldwide Quarterly Ethernet Switch Tracker and Worldwide Quarterly Router Tracker. “Overall revenue and port shipment growth rebounded somewhat in 3Q15, even though the usually strong 10Gb segment continued to see weakness in year-over-year revenues,” says Rohit Mehra , Vice President, Network Infrastructure, IDC. 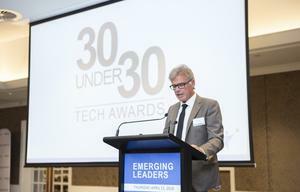 “At any rate, shipments of 10Gb Ethernet and higher speeds is a testament to the strong demand to support a diverse array of enterprise and data centre workloads and service provider infrastructure. From a geographic perspective, the 3Q15 Ethernet switch market in Asia/Pacific, excluding Japan, increased a solid 3.9 percent year over year carried mainly by Korea (up 19.2 percent year over year) and Hong Kong (up 13.4 percent year over year). Mehra says 10Gb Ethernet switch (Layer 2/3) revenue decreased -1.6 percent year over year, coming in at $US2.2 billion while 10Gb Ethernet switch port shipments grew a robust 27.4 percent year over year with nearly 8.5 million ports shipped in 3Q15 as average selling prices continued to fall. In addition, 40Gb Ethernet revenue reached a record $US644 million in 3Q15, growing 41.4 percent year over year. Mehra forecasts that 10Gb and 40Gb Ethernet are expected to continue to be the primary drivers of the overall Ethernet switch market in the near-term - 1Gb Ethernet switch revenue declined slightly (-0.3 percent year-over-year) as this segment continues to face price erosion. The worldwide enterprise and service provider router market was flat on a year-over-year basis in 3Q15 as the 1.1 percent annual increase in the Service Provider segment was offset by a -3.5 percent decline in Enterprise routing. For Mehra, this will be a market to watch closely over the coming quarters as software-defined architectures start to take hold across the WAN, enabling enterprise network managers and service providers alike to benefit from these emerging capabilities. Cisco finished the quarter with 0.8 percent year-over-year growth in the Ethernet switching market and market share of 61.6 percent, up slightly from its 60.1 percent share in 2Q15. In the hotly contested 10GbE segment, Cisco held 59.1 percent of the market in 1Q15, up from 57.6 percent in the previous quarter, but down from the 63.4 percent it held in 3Q14. Cisco's service provider and enterprise router revenue decreased -2.3 percent year-over-year. 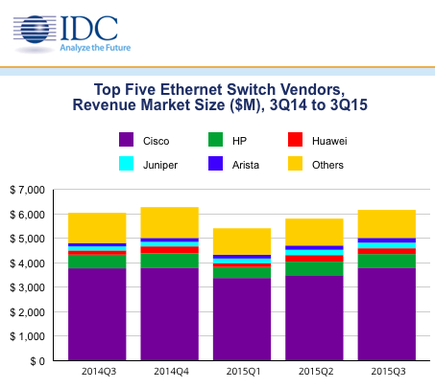 HP's Ethernet switch revenue came in essentially flat on both an annual and sequential basis in 3Q15. HP's market share stands at 9.0 percent in 3Q15, slightly below its 9.3 percent share in 3Q14. HP's solid year-over-year performance in the 10Gb (up 8.8 percent) and 40Gb (up 68.1 percent) segments was offset by the 11 percent year-over-year decline in 1G switching. Juniper had a record quarter in Ethernet switching with a year-over-year increase of 39.4 percent and sequential growth of 6.5 percent in 3Q15. Its router revenue was flat sequentially but increased 11.0 percent year over year in 3Q15 due to a robust 20 percent year-over-year increase in sales of core service provider routers. Huawei continued to perform well in both the Ethernet switch and the router markets. Huawei's Ethernet switch revenue grew 36.7 percent year over year in 3Q15 while the enterprise and SP router revenue increased 8.9 percent year over year in 3Q15. 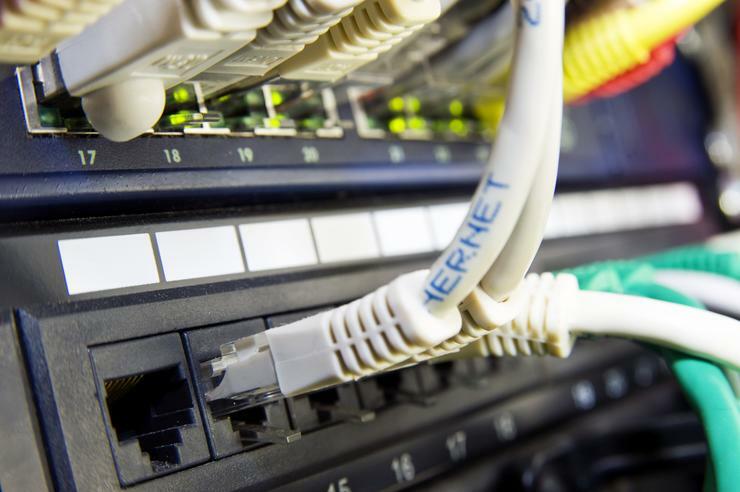 “While demand for higher speeds such as 10Gb and 40Gb Ethernet increases, declining average switch port selling prices have had a flattening effect on overall market growth,” adds Petr Jirovsky , Research Manager of Networking Trackers Group, IDC.